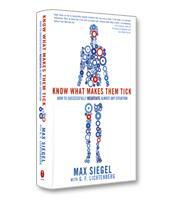 According to Max Siegal, the secret to success is knowing what makes other people tick. In his book, Siegal outlines nine universal rules and reveals strategies for negotiating challenges in every part of life. Max Siegel is the epitome of what many people would call "the self-made man." He had a rough start to life in his early years as the son of an African-American mother and white Jewish father. He suffered poverty and violence during his teen years but overcame the obstacles in his life to become a phenomenally successful executive and business owner. Today, his marketing and branding agency works with some of the world’s top sports teams, recording artists, NASCAR drivers and athletes. His success, he writes, comes from concentrating on what makes other people tick. As a respected business expert and attorney with many years of success helping other people reach their goals in a vast array of careers and industries, Siegel’s simple formula for effective negotiations and relationships is the direct result of his diverse experiences at work and in life. He has spent many years getting into the heads of his clients and negotiation partners while working with them to create outcomes that address their most important needs. Evidence of the effectiveness of his approach can be found by counting the successes of his numerous business clients. Siegel turned his hard-knock life into a blossoming career as a lawyer and businessman by using the people skills he accumulated while involved in a variety of high-pressure, high-powered jobs. When he was president of global operations at Dale Earnhardt Inc., he was the highest ranking African-American executive in NASCAR. Vivid memories from his experiences in a variety of fields illustrate the simple rules that have helped him succeed in his illustrious career. The simplicity of Siegel’s strategies for finding the ticking heart of another person’s motivations is what makes it so applicable to the negotiations in anyone’s daily life. For example, he starts off with the basics of listening. Siegel reminds readers that there are easy ways to get and stay engaged when another person is talking. Body language speaks volumes when having a meaningful conversation, he points out, so remember to keep track of your tone of voice as well as your movements and gestures. This tells the other person that you are paying attention without speaking a word. Great listeners also make the other person feel comfortable, safe and respected. Starting off a conversation on a neutral subject can also help get the negotiation moving forward, Siegel writes. Looking forward into a positive future is another important habit that can help people and organizations get what they need. Recognizing this, Siegel explains that another important mantra that has helped him reach his goals is, "See where you want to be, not where you are." One way to infuse this kind of thinking into your daily life is to remember that life rarely goes exactly as planned. One example of this from Siegel’s career is the story of how he and a partner got their talent agency started by being flexible enough to roll with a prospective client’s busy schedule. After a 20-hour drive to visit a gospel singer they wanted to sign, Siegel and his friend Mickey Carter learned that their meeting would be cut short because the singer was playing in a charity basketball game. Instead of becoming frustrated, the men turned the situation around by asking if they could play. After time on the court together with the singer, learning what made each other tick, the talent scouts became talent agents when they signed their first client. Siegel points out that there was no pre-written plan to play basketball with the singer at a charity event. Flowing with the situation as it unfolded and remembering their original goals helped them realize their dreams and start their talent agency. Sprinkled with his belief in the power of spiritual values, Siegel’s latest book highlights the valuable insights he has collected from a career working among some of history’s top performers and athletes. Every chapter offers thoughtful guidance for building a stronger relationship with anyone.